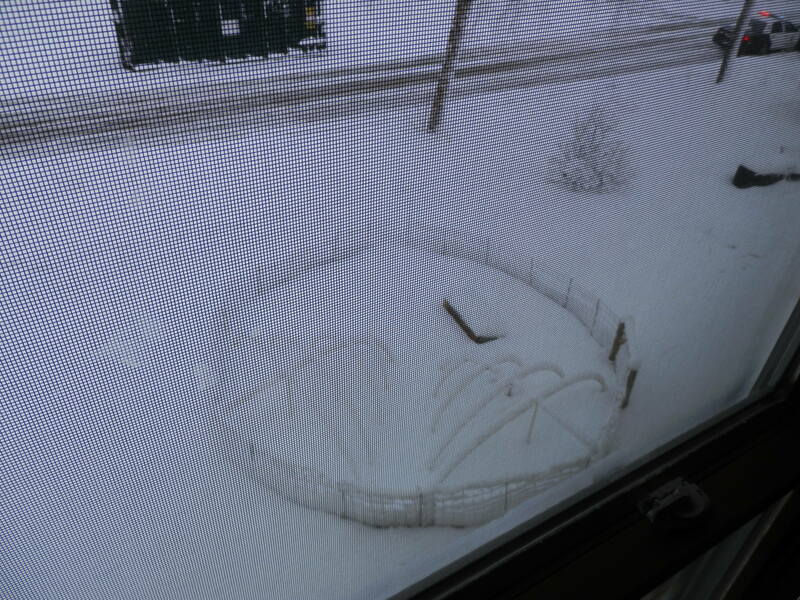 Last year I “graduated” from the urban farming program at the Permaculture Research Institute for Cold Climate. I don’t believe I achieved “expertise,” but I did gain some useful knowledge, I devoted much more time to my garden, and I have become part of a community of food growers. It was a good experience that left me eager to see what I could do the next growing season. In January, I began creating a new garden plan using the website GrowVeg. We had expanded the garden so there wasn’t much additional sunny space. I added 2 raised beds by the garage (one on top of the driveway), a couple of wine-barrel container gardens, and then shifted my eyes upward, toward trellising. I acknowledged some areas of defeat: too dry next to the house, too shady in the herb bed, and too distant in the front flower bed. Instead of adding a lot more food, this year we will be adding boxes and trellises, fences and arbors. We’ll work on increasing our rainwater storage capacity and we’ll improve the pathways through the yard. I began collecting images of fences and arbors on Pinterest. I finally found a garden planning book that I liked at the blog Northwest Edible Life. It had all the sections I thought I would use and it’s downloadable, so I can print out just the pages I want. In February, I pulled out my new gardening bible, “The Week-by-Week Vegetable Gardener’s Handbook: Make the Most of Your Growing Season.” I was determined to do something I had never done before — get my plants started at the right time. Last year we bought a flourescent light and tried to grow seedlings. It was a dismal failure. We had only a few weak broccoli to put in the ground in the spring of 2012. This year we got 2 more light fixtures and hooked them together. We hung the lights at the right height this time and when we saw that the plants on the outer edge were reaching for light, we added one more light. We bought 3 heat pads to warm the feet of the summer-loving tomatoes and peppers and left two trays without heat for our cold-weather crops. And Peter set up a fan to help them develop strength. I had bought some organic seeds at Linders at the end of the season – 75% off. I had some seeds left from last year and friends gave me seeds. I also rejoined the Southside Food Hub and got seeds there (as well as berries). For some specific items, I bought seed from Johnny’s and from Seed Savers. Although I had been negligent about record-keeping last summer, I did remember one lesson. When it comes to tomatoes, I want quantity more than variety. I want to make lots and lots of sauce! This year I limited myself to Big Boy, Beefsteak, Brandywine and San Marzano. I also decided some crops just aren’t worth the bother. I can’t grow broccoli or cauliflower worth a darn. I’ll buy those. Our first experiment in winter seed sowing. In addition to (far too many) tomatoes, I planted hot and sweet peppers, pumpkin, squash, brussel sprouts, kale, collards, cabbage, onions, peas, purple runner beans, ground cherries, sunflowers and melon. I followed the book to determine when to plant so I wouldn’t have things indoors for too long. So far, so good. We had the right equipment and we established a routine. Peter turned the light on when he left for work and gave the plants a good watering. I misted them throughout the day and turned off the lights at night.We had two mysterious incidents of die-off where a segment of a plant tray, which had been doing wonderfully well, would suddenly be found dead in the morning. It happened to some peppers and tomatoes. We never figured out why. 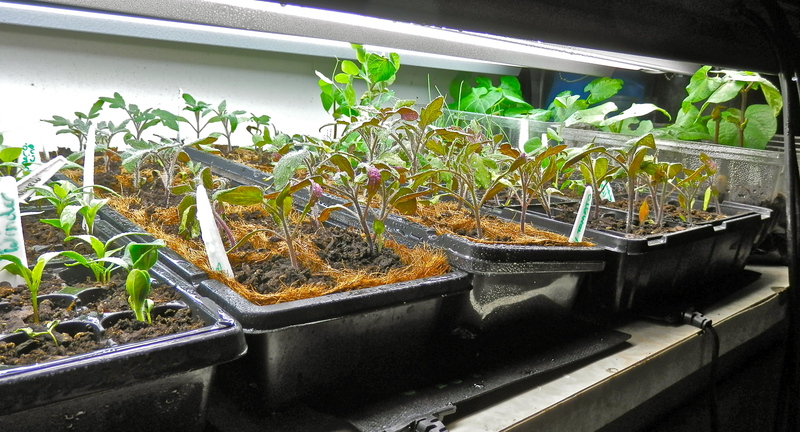 As they got larger, I transplanted seedlings into larger buckets to give their rooms space to develop. 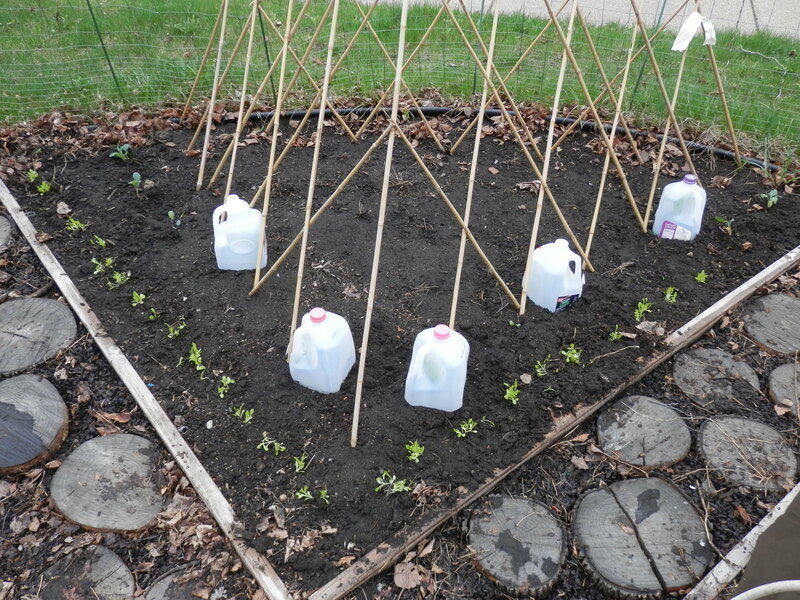 After a month or two, I began transplanting the larger seedlings into milk carton bottoms — beans and sunflowers and tomatoes. We raised the light fixtures on one end to accommodate them. Now things got tricky. I had room in the laundry for five trays of seedlings. I didn’t have room for trays and cartons. What was I thinking! 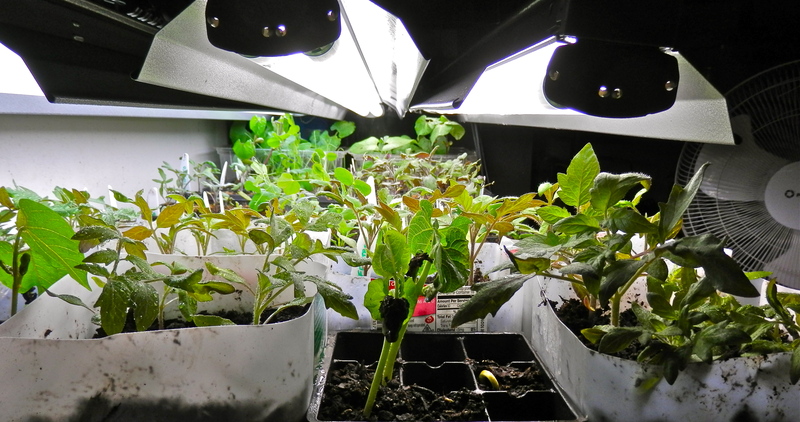 I took the cold weather seedlings upstairs and put them along the south-facing windows. I opened the piano windows and put them in between the inner and outer windows. If a set appeared to be doing poorly, I’d rotate it back downstairs for more direct light. Once the snow was gone – the first time – I started taking them out for half-days in the sun. That was more punishing than I had expected. Some of the babies got bleached leaves. Those who suffered the most were brought back downstairs to stay with the grow light. I took the rest of them in and out every day, filling the table tops with plants every evening for several weeks. We achieved new high temp records in our compost pile. Last fall I raked all the leaves into the garden beds and left them. In April I raked the leaves out and Peter dug out the compost bins. 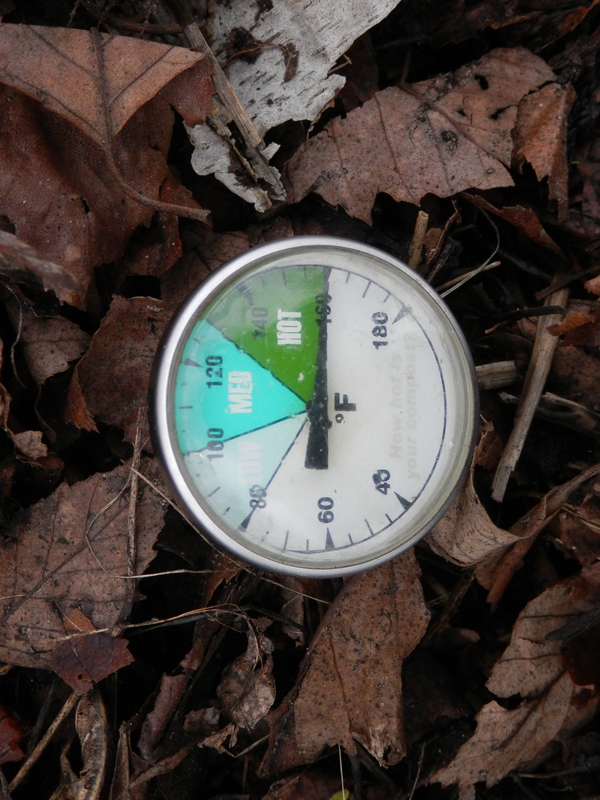 He layered the breaking-down leaves and the food compost that had gathered over the winter and the pile began to reach impressive heights – he measured 160 degrees F one week! Garlic and strawberries were already in the ground from last year. I uncovered them and there was no damage, despite our extended fall. Of course, I had to cover them up again – and again – and again, as we had unseasonal snowfalls even into May. Not going to be putting things into the garden yet – the first week of May! First in the ground was the lettuce, kale, cabbage and collards. A week later I put in the peppers and beans – and promptly had to dig them up and bring them back indoors as night-time temperatures plunged. A week later I put in the brussel sprouts and some of the onions. A week later I put in more onions and seeded the beets and turnips. A week later I put the peppers back in and planted some of the tomatoes. 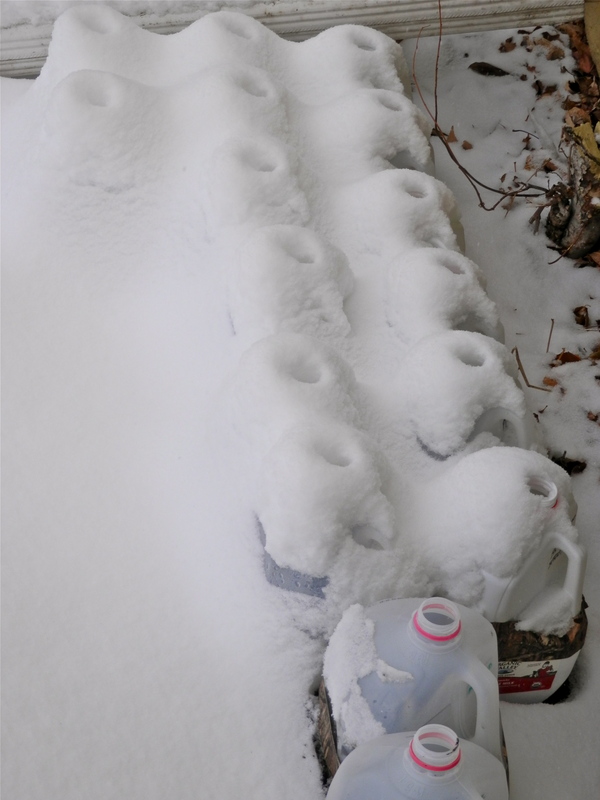 My enthusiasm for getting some of these seedlings planted meant I needed to protect them from several cold snaps. They looked like they were suffering. I decided to risk it. I used those salvaged milk cartons as protection. As of today, everything is in the ground and looking very healthy. Saskatoon shrubs have been planted near the sidewalk. Grapes have been moved to the back where we will be building an arbor. Raspberries have been moved closer to the house. Last year I spent more than $300 on plants, and $50 or so buying seeds that mostly didn’t work out. This year I spent $46 on the saskatoon bushes and $40 for the food hub membership with its seeds and plants. Catalog seed purchased was less than $25. I spent money on lights and warming pads but of course those will be reused. Overall, I’ve saved quite a lot of money and I’ve gotten exactly the plants I wanted … but it certainly did take effort. When I do this again, I’ll need a better plan for storing the plants as they grow larger to minimize all the moving in and out. This entry was posted in Food/gardening, Reskilling and tagged gardening, indoor seed sowing, winter seed sowing. Bookmark the permalink.